If you’ve visited SouthEast Asia, you’ve certainly seen a variety of buddhist religious structures. 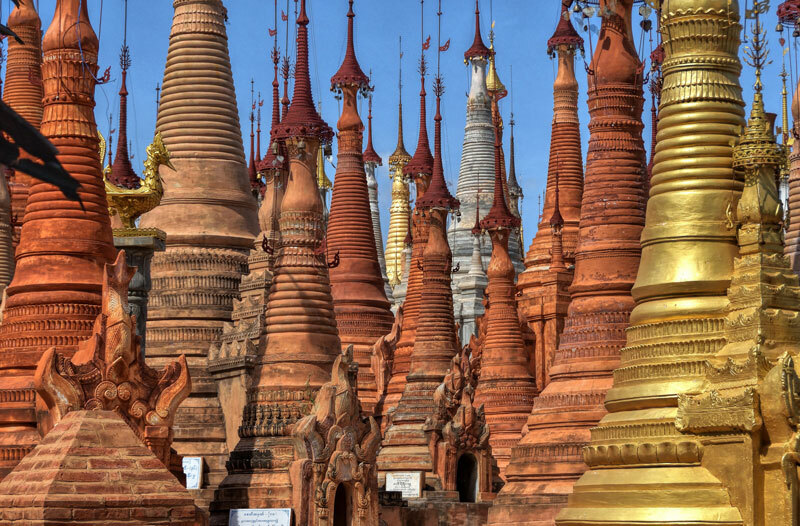 Myanmar is home to many famous stupas, pagodas and temples. Are you wondering what the difference is between a stupa, a pagoda, and a temple? Here is an guide to understanding what they are and how they differ. A temple is a place of worship. Similar to a church for Christians or a mosque for Muslims, a temple is where Buddhists come to mediate. It is usually a collection of buildings, stupas, pagodas and wats. The architectural style varies greatly throughout Asia, but they are always built to face the East or South for better luck and designed to inspire inner and outer peace. A stupa is a dome or bell shaped structure used as monuments, traditionally used to store religious sacred relics of the Buddha. They were first used in India and quickly spread across Asia becoming more elaborately decorated with time. Stupas are enclosed and without entrances, as to protect the sacred relics contained within. They have also been used as burial mounds and monuments to deceased royalty and men of religious importance. While there is not a clear distinction between a stupa and a pagoda, a stupa tends to be a structure that usually can not be entered, while a pagoda is often referred to as a building that can be entered. It is easy to get confused because a pagoda is generally a temple, but the design of a pagoda evolved from stupas. Traveling through Inle Lake you will most likely see temples, stupas, and pagodas. The monasteries in Nyaungshwe and on the lake include temples for meditation and worship. The Phaung Daw Oo Pagoda is an impressive gold pagoda temple located on Inle Lake. It is a common stop on the boat tours. You can see impressive collections of stupas around Inle Lake at the Innoo Pagoda or the Indein Pagoda. If you want to see any of these structures just ask reception at Song of Travel Hostel Inle Lake and we are happy to give you directions or arrange a tour.